MPEG-4 Audio provides complete coverage of the bitrate range of 2 to 64 kbit/s. Good coded speech is obtained already at 2 kbit/s and transparent quality of monophonic music sampled at 48 kHz and 16 bits/sample is obtained at 64 kbit/s. Three classes of algorithms are used in the standard. The first covers the low bitrate range and has been designed to encode speech. The second can be used in the midrange to encode both speech and music. The third can be used in the high bitrate range and can be used for any audio signal. Various forms of audio lossless coding. 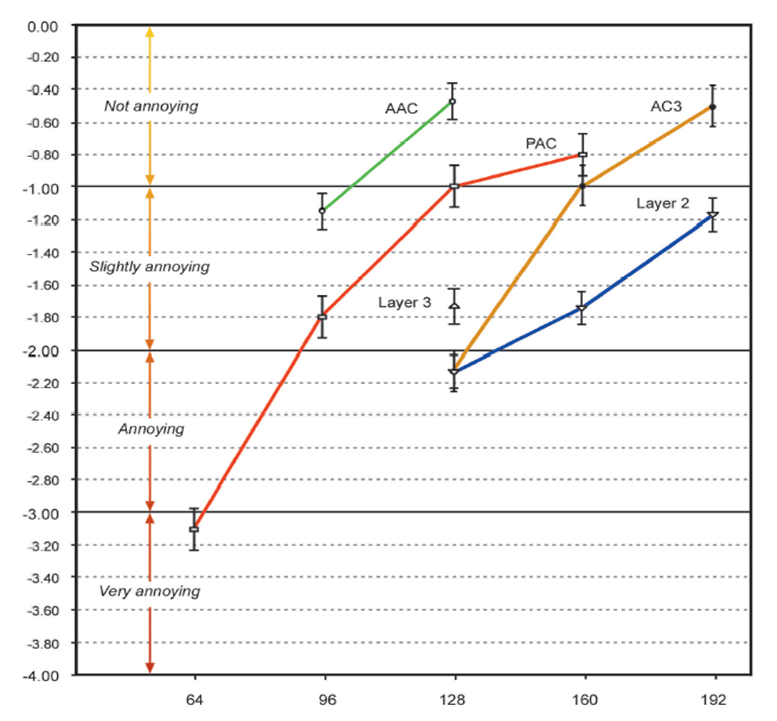 MPEG-4 AAC is MPEG-2 AAC with the addition of one tool: Perceptual Noise Substitution (PNS). This tool identifies and codes as random noise segments of spectral coefficients that appear to be noise-like. This is achieved by indicating that PNS is used and the value of the average power of the noise. A decoder uses a pseudo-random noise generator weighted by the signaled power value to reconstruct those coefficients. The addition of Spectral Band Replication (SBR) MPEG-4 AAC has provided significant performance improvements. SBR consists of replicating the highband, i.e. the high frequency part of the spectrum. A small amount of data representing a parametric description of the highband is encoded and used in the decoding process. The data rate is by far below the data rate required when using conventional AAC coding of the highband. 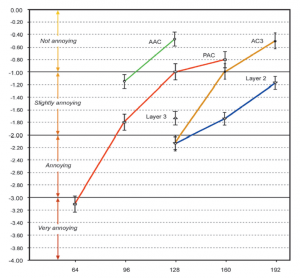 The MPEG-4 AA performance has been tested against a number of alternatives at different bitrates. the results are given in Figure 4.